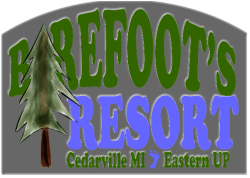 Barefoot's Resort preserves the treasured tradition of the relaxed Michigan lake resort. Family-owned and clean, Barefoot's Resort is one of the best-kept secrets in the Eastern U.P. Check out our Facebook page for more pictures and updates on the fishing and vacancies! Across the Straits of Mackinac await the wonders of the historic Les Cheneaux Islands. Walt and Freda Barefoot first discovered this small piece of heaven 50 years ago, and purchased seven acres of wooded lakefront on scenic Hill Island, near Cedarville. They built five modern cottages and a boat house along 308 feet of sandy beach, inviting the world to share their dream. Over the years, when ten RV campsites and a mobile home were added, care was taken to preserve the authentic character of their resort. 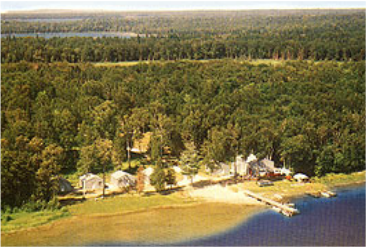 Barefoot's Resort is located within a short distance of Mackinac Island, Sault Ste. Marie, and the many attractions of the Eastern U.P. This secluded paradise offers excellent fishing and water sports, with over 30 islands that provide numerous sheltered channels and quiet coves for anglers and boaters. Throughout these distinctive waterways can be found some of Lake Huron's best fishing. The sincere goal of our resort is to make your stay pleasant and memorable. Barefoot's Resort is all about memories. What will your memory be? Tasting your first cup of hot coffee in the crisp pine air during a glorious sunrise, building sand castles with a child on the beach, netting a 20-pound king salmon from the crystal-blue depths, enjoying the splendid fall colors on a boat ride through the maze-like channels, or making new friendships around a crackling campfire under a canopy of brilliant stars? It's all here for you, at one of Michigan’s most unique family-owned and operated vacation destinations. Barefoot’s Resort has now passed to Walt and Freda’s children. We invite you to join us, where the water is clear, the air is fresh, and the sky is a deeper blue.